Defence and Military Veterans Minister Nosiviwe Mapisa-Nqakula is scheduled to visit southern Gauteng tomorrow to see first-hand progress on the “Vaal River rehabilitation project”. The national defence force was tasked to be part of the overall clean-up of the Vaal by Finance Minister Tito Mboweni during his medium term budget policy statement in October. The then newly minted finance minister told MPs both President Cyril Ramaphosa, who is SA National Defence Force (SANDF) Commander-in-Chief, and Mapisa-Nqakula hadagreed to military assistance, in the form of engineering and other expertise, to seek a “solution to the Vaal River water crisis”. The river supplies water to South Africa’s economic and industrial hub and has become increasingly polluted by what appears to be a lack of maintenance by local authorities on water pumping and purification equipment as well as pollution leaching into the water from industrial and other plants. The national defence force, in the form of the SA Army Engineer Formation, was tasked as the lead military component and this week saw an advance of about 200 soldiers move into the Vanderbijlpark reservoir complex. ENCA reported the soldiers will set up base at the reservoir with another 300 soldiers arriving in due course to make up the Vaal River task force. The TV station did not indicate from which formation or unit the soldiers were. Minister Mapisa-Nqakula will, according to her office, inspect two water treatment plants and three pump stations. These are apparently the target of thieves and vandals and will be guarded by soldiers for at least the next 12 months. 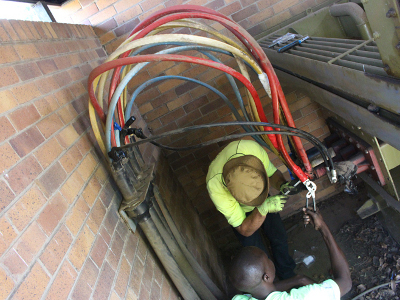 In October a waste water treatment plant belonging to Emfuleni local municipality was targeted by cable thieves who killed a security officer detailed to guard the installation. The Minister is also scheduled to meet with business leaders and “other stakeholders” in and around Emfuleni local municipality. “Local government leaders and Rand Water officials will accompany the minster and the apex leadership of the SANDF” on the visit her office said. “The rehabilitation of the Vaal River system is a priority to us and we cannot succeed alone. The visit on Friday is not only meant to check on progress made by the army, but to garner support from surrounding communities and business people in the area. We are of the view that working together with external stakeholders could assist us in finding sustainable solutions to the water crisis in the Vaal River system,” Mapisa-Nqakula said in a statement.